Home › HUDSON › Manuals, etc,. September 2016 in Manuals, etc,. Jet front brake cups, what size do I buy? Roy, they are 1-1/8" in front and 1/16" in back, like the LWB Stepdowns, but wheel cylinders are different. 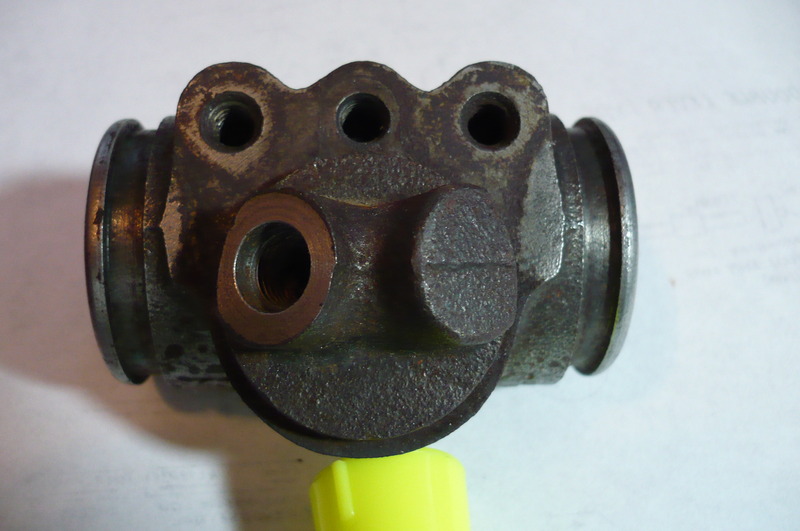 You can get NEW front wheel cylinders: Centric 134.66001 & Centric 134.66002 (also used on Chevy K10 trucks of the early 60's) but you must re-use the pistons that have the flat side that the brake shoes ride on, just take the hollow cone type pistons out of the new Centric wheel cylinders, clean up the original Jet pistons and install them with rubber dust boot into the new Centric wheel cylinders. Those original cylinders are probably corroded badly and will not hone pit free, so will most likely still leak. I have seen the new Centric 134.66001 & 134.66002 selling for $16-20 each online. Auto parts stores can get them, but expect to pay $30+ at auto parts stores. 134.66001 is for left (drivers) side and 134.66002 is for right (passengers) side. Unless the photo is incorrect, that Centric cylinder won't interchange with the Jet front. It's a 1-1/8 dia., alright, but the similarity ends there. Best bet is to have yours sleeved but, as Ken says, keep your hands on the pistons and boots. Cups are common.....the rest isn't. Attached is a photo of a Jet front cyl. Note the relative position of the bore centerline to the mounting. There is a 1-1/8" cyl. that looks similar (I don't recall the application off-hand) but the bore is in a different location (vertically speaking) and won't work. Rear is a similar story and there is a replacement available but, again, keep a firm grip on your pistons and boots because the new one (NAPA 36029) is designed for a brake using "shoe links" so the boot is different from the Jet, which has the shoe-end bearing directly on the steel button pressed into the Aluminum piston. The boot is NAPA UP 5994 in case you need to replace yours. The new rear cyl. will not have the correct piston but the machined casting is identical. Repair kits for the front are listed as UP 164 but won't give you the Al pistons. Rear kit available (NAPA UP 170) but I wouldn't waste my time rebuilding one when the new one is cheap and you must use your old pistons in either case. Left and right are the same cyl. on rear but not front. None of these parts are "on the shelf" ordinarily but you should be able to order them. Just a heads-up, the Jet cylinders listed on Rock Auto's site are not correct. The numbers I've shown are NAPA p/ns but may be crossed to whomever you may prefer. It is correct (compare my end-view to theirs) ......but good luck finding them. I've been through this before, even talked directly to Dorman who said some day they might make another run of those (L & R are the same except for opposing hose connections). I found one at the Colo. Sprgs. Nats (Thanks Stu!) and gobbled it up immediately, but have never run across any before......or since. If not for it being a low demand brake system part, I'd make them myself. I once checked with a local supplier whose computer showed one. It was $65 + freight-in. I grabbed it only to find that someone had switched the box contents with some common cylinder. Damn! The box was correctly marked. I got my $ back on the part but they made me eat the shipping. I won't forget that. Bottom line: Don't let loose of your front or rear pistons, have the fronts sleeved and get the new rears. Kits for both have the boots as well (from NAPA, anyway), but I find availability to be challenging. A few distribution centers show them at various places around the country and the NAPA Supplier shows them, so they should exist. Rock lies occasionally. Their shoes appear to be correct. The Amazon parts have a note saying "We don't know when or if these parts will be back in stock". I think I do. They were used on the Jeep DJ5 Dispatcher (Mail) 2WD in the mid 60's, and some other Willy's Jeep Products. They are available from at least one vintage Jeep parts vendor, but at $98 each side. 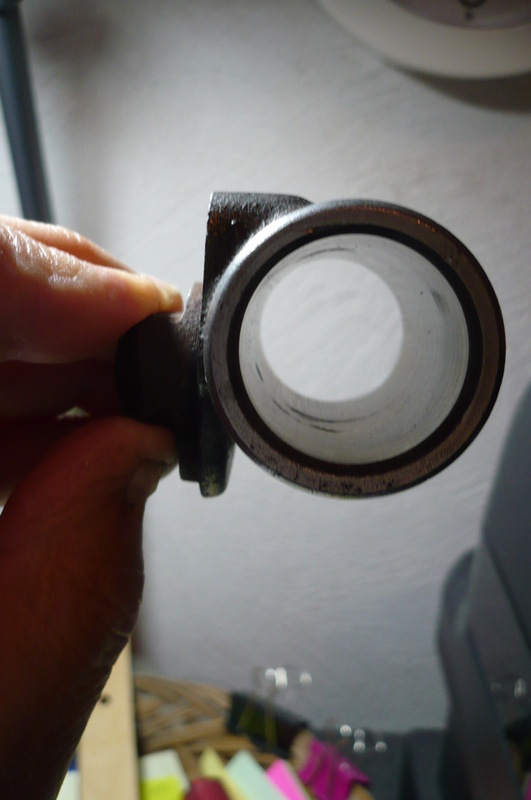 There is a more readily available 1" ID (cheaper) version of this cylinder, used on 60's CJ's, looks to be the same 1-1/4" bolt spacing, same offset of the mounting to the cylinder, but not known if the wall thickness is such as to allow it to be bored out the 1-1/8" safely. Rock Auto, about a year ago considered the #55 brake shoe for the Jet. I drew their attention to the fact that it was not a correct application at that time. Apparently they did make a change in the shoes they were recommending if you say they now have the correct shoe #51 available. In my previous post, I had commented on the incorrect listing for the shoes but deleted it after a "fact check". If they have changed to the #51, they should be correct. Their photo appears to bear that out.